Despite the simplicity that has made it the most popular of all existing poker variations, you still need to take your time to learn how to play Texas Hold’em if you want to be able to win and avoid losing money – specially once you begin playing against experienced opponents. In this article we will cover the basics, starting with the game’s rules. Before cards are even dealt, you will see that there is a button assigned to a seat. This is known as the dealer’s button, and it is passed over to the left each time a hand has been completed. It’s used to keep track on what seat is assigned the dealer’s role, handing the first card to the player on its left – who has to place the small blind. When playing with friends, the person with this button has to be in charge of dealing the cards, preparing and showing the flop, the turn and the river; however, when playing in a casino, the dealer takes care of doing this and uses the button as a guide. 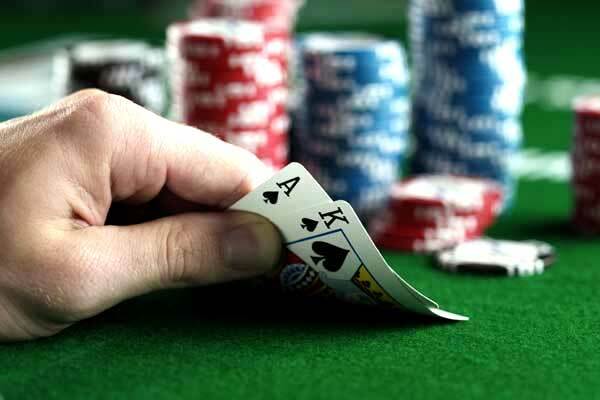 As mentioned before, the player left of the dealer’s button needs to place a small blind before the cards are dealt, which is ½ of the big blind that needs to be placed by the following player to the left. Any player that wants to bet in a hand needs to either pay the big blind, or raise the bet. Once all other players have decided to bet or fold, the small blind can either match the big blind to continue – or the total amount of the bet if someone raised the bet – and the big blind can check, raise, or pay if someone increased the bet. Before going over the stages of the game, let’s go over how the game works. At the beginning of the game you will get two cards, which are cards only you can use, and throughout the game, five cards will be shown in the middle of the table – everyone is allowed to use these cards. The game consists on using all cards at your disposal to create the best possible hand by using a total of five cards. This means you can use the five cards on the table, four in the table and one in your hand, or three from the table and two from your hand. 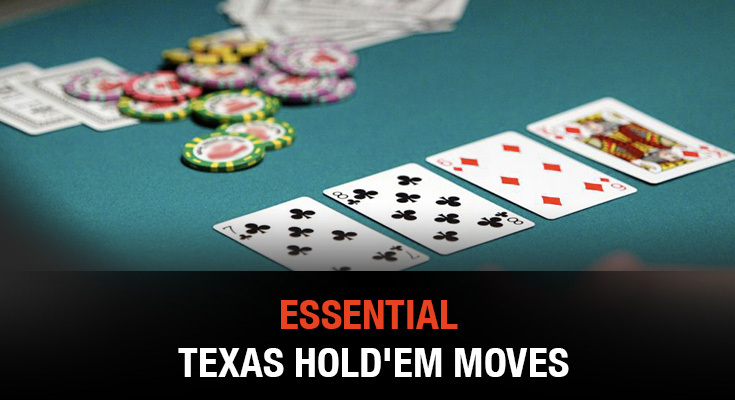 Now that you know the possible hands available when playing poker, it’s time to go over the different stages involved in a Texas Hold’em game. The game starts with the placing of the dealer’s button, small blind and big blind. Once these are in place, the first two cards are dealt, handing one at a time in a clockwise manner. This then leads to the pre-flop round which is explained earlier, moment when all players have a chance to decide if they want to match the big-blind or raise the bet. After the initial round of bets is over, one card is “burnt” – meaning the top card of the deck is removed – and the following three are shown, also known as the flop. Once the flop is shown, another betting round will take place, beginning with the first remaining player to the left of the dealer’s button. Players can check – pass without betting – as long as no-one has decided to bet. If a player checks or matches a bet and another player raises the bet afterwards, the process continues until all bets are equal, or players fold. If you fold, you leave the hand and can’t get back in regardless of the situation. You won’t be able to bet again until the next hand is dealt. Once the betting round for the flop is over, another card is burnt and one more card is shown, which is known as the turn. This is then followed by another betting round. Finally, a last card is burnt and a last card is shown – also known as a river – which leads to the final betting round. The moment all bets are paid, cards are shown and the best hand wins the pot – unless there’s only one player remaining, in which case they will receive the pot and can choose to not show their hand. In this article we have covered the basics for playing Texas Hold’em, and now that you have familiarized yourself with these, its time to cover some aspects regarding the specifics of playing Texas Hold’em online, so continue preparing yourself by reading the following article: How to play Texas Hold’em Online – Part I.